We offer highly efficient aluminium cooling packages for Genset applications for operating in closed sound insulated canopies. Typically Banco offers a plug and plays solution for Genset manufacturers, providing a complete cooling solution that includes Radiator/Inter-cooler/Expansive Tanks/Mounting Frame/NL Tanks/Pressure Cap/Cowl/Stone Guard and Flexible Hosing. The option of plastic or aluminium tank is available. We offer heavy duty copper/brass radiators in tandem with Aluminium charge air coolers/Fuel coolers/Aftercoolers for Genset applications above 200 KVA. Typically Banco offers a plug and plays solution to Genset manufacturers, providing a complete cooling solution that includes the entire cooling assembly inclusive of the fan and the motor. 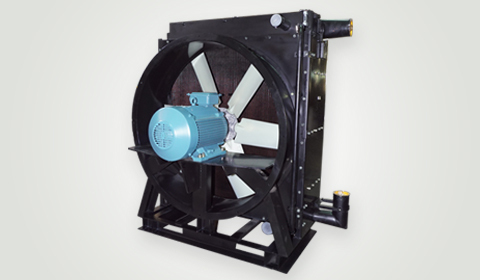 We provide the option of an electric modular fan motor assembly for enhanced cooling, this reduces the power utilization of the fan motor as the number of fans operating is modulated by the heat loss requirement of the engine and the ambient temperature.